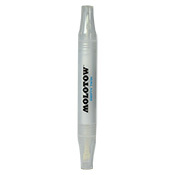 Question: Do you think it would be possible to use the Molotow Transformer Black Ink in this marker? if you havent used the twin yet, your best guess would be appreciated. I was just thinking a Twin Transformer Black Marker could be great in an AP blackbook. It looks like these markers comes with a Cotton type filler in them? A lot like the Mini and Ultrawide markers. I was told that the Transformer Ink works well in the Molotow Tank Marker and Mini/Ultrawide marker. The Transformer Black is considered a Transparent Ink and it is thinner than Both the Cocktail Inks. Answer: (AP Reply) I don/t see why not, although I wonder how it will handle when it starts drying out. Worth a test though.